Whatever your reasons may be for purchasing a boat, it is important you choose the right boat for you, your family and your lifestyle. There are many factors that will influence your initial decision from looks and performance, to usage, cost, size, maintenance constraints, equipment and options – and let’s not forget safety. Boating is an emotional investment of time, energy and financial resources. Beneteau America attends nearly 90 boat shows in the Americas each year, which gives us a unique opportunity to talk to hundreds of new boat buyers each season. We have developed a keen understanding of buyer behavior and have identified five key considerations the majority of new boat owners rationalize during the buying process. 1. What are your dreams made of? Where do you want to boat (fresh or salt water - Lakes, river, ocean) and what activities do you envision for yourself, you and your spouse or your whole family? How often do you see yourself out on the water? Whether your plans include coastal cruising, racing, fishing, island hoping, scuba diving or possibly living aboard, there is a boat perfectly suited for your intended use and time on the water. 2. Who are you going to trust? Beyond friends’ recommendations and the overwhelming amount of information available online, in the end your purchase decision comes down to two categories of professionals. Each critically important to the boat buying process: the manufacturer of your future boat, and the new boat dealer who will sell and service your boat throughout your ownership. These two groups have very distinct roles but both warrant your careful study. There are plenty of boat manufacturers. Choosing one is not an easy task. Consider reliability, longevity and reputation of the boatbuilder. Trust the manufacturer who knows boats, boaters’ expectations, and will be around long after you purchase your new yacht to deliver on its warranty. Beneteau has been manufacturing quality sailboats and powerboats for over 130 years – including 30 years in Marion, South Carolina – and is the market leader in recreational boating today. The brand is trusted by thousands of boaters worldwide. Beneteau boats have shown to retain their value over time better than any other brand of boats on the water. Together with its dealer network, Beneteau has been rewarded for many years with the CSI award for its excellence in boat production and customer service. Click here to understand how Beneteau makes the difference from innovation to performance, seaworthiness, quality and safety. Once you’ve identified the type of boat you are leaning toward, choose your dealership according to its location, facilities, reputation in sales and service. Look for friendly people you like. This will be a long-term relationship so you want to work with a company where people sincerely care about you and your boating experience. Rest assured you can trust Beneteau’s network of authorized dealers to provide the best in service – from boat maintenance and repairs, to concierge services and assistance with other matters like financing, insurance, registration, and dockage. When you partner with a Beneteau dealer, you choose much more than a salesperson or broker. Indeed, you will gain access to a wealth of information and be able to tap into a wide network of connections in the marine industry near you. For example, knowing the local dockmasters helps a broker stay up on slip availability which is tightening up again as the economy continues to improve. When you visit Beneteau at a boat show, ask to speak to the authorized dealership covering your home port, and if you are not yet familiar with their operations, schedule a tour of their office and marina. Finally, remember why you are buying your boat in the first place. Some people buy a boat to get away from it all – others want to draw the family closer together. Chances are owning a boat will help you grow your social circles and make new friends. A dealer network like Beneteau’s offers much more that a transaction-based relationship. The proof is in the growing number of community events driven by our authorized dealers and supported by Beneteau – such as Beneteau rendezvous where owners gather for a raft-up or destination cruise and Beneteau regattas. Purchasing a used boat may seem attractive due to the reduced upfront expense; however, the cost and time required to haul out, survey, repair, refit, equip your new-to-you boat may not be worth it. Some owners want a “project” and buying a used sailboat or powerboat means working on the boat in their spare time. If your primary goal is to enjoy your boat on the water, consider the advantages of buying a new boat and avoid the hassle – especially when there are so many potential unknowns with a used boat. One major benefit of buying new is that the boat usually comes with a warranty. A new boat like a Beneteau sailboat or powerboat comes with a manufacturer warranty that ensures your boat and its equipment are protected against defects for the initial ownership period. The Beneteau warranty goes further, ensuring virtually bow to stern coverage for 3 years provided you follow the mandated service schedule. 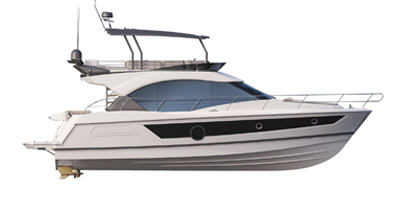 This warranty and the associated work are covered by Beneteau and your dealer. Once again, you can appreciate the value of working with a professional dealer far beyond the purchase and commissioning of your new Beneteau. Be sure to investigate the warranties for every new boat you are considering. Warranties are valuable and an important factor that should influence your decision. Some warranties are transferable, which may become a selling point if you decide to sell your boat. Find out what the warranty includes (engine, hull, components, accessories, service, etc.) and find out about the service you will receive if something fails. Warranties vary in length of time so ask. You should also pay special attention to the type of warranty being offered. Some manufacturers offer a third-party warranty which is essentially a term insurance policy. Their vested interest is to mitigate their exposure. A manufacturer-backed warranty like Beneteau’s is an agreement between the boat owner and the boatbuilder. In addition to the warranty coverage of your new boat, purchasing a new yacht over a used one means you will enjoy the latest in design, technology, and equipment. The latest hull designs strive to offer better fuel efficiency while optimizing livability onboard – think about the growing beams of boats in the last decade for that very reason! The newest generation of navigation instruments comes with all the bells and whistles that make boating safer and more fun. This is evident at most helm stations, where the chart plotters now boast generous screen size upwards of 14 to 16 inches. The user experience is further improved thanks to touchscreen displays and better ergonomics. Many of these attributes are readily available on a new boat but are not easily retrofitted on a used vessel. When it comes to onboard comfort, many owners simply prefer a vessel with unblemished flooring and upholstery, new heads, appliances and mattresses over used ones. Purchasing a boat requires evaluating your budget and discussing financing options. When you choose to buy a new Beneteau, you gain access to our financing partner SGB Finance North America. Their team of marine lending experts consists of boaters who have an extensive background in the industry. SGB can provide a unique competitive offer along with flexibility and responsiveness to meet your financing needs. Trust your Beneteau dealer to provide guidance with regard to boat financing, and to collaborate with an experienced financial expert from SGB if necessary. Additionally, your Beneteau dealer is a reliable resource to help you estimate the total cost of ownership and to provide assistance with insurance, dockage and maintenance scheduling. Boating is a lot of fun but requires some initial skill and experience. We encourage you and your family to take boat safety and operations courses to learn the rules of the road, and build your skills and confidence as a boat owner and operator. The more you know, the safer you’ll be. Becoming familiar with your new boat and understanding how it operates is part of the commissioning process of all of our authorized Beneteau dealers in the Americas. Many of them provide on-the-water training as well. Do not hesitate to rely on your Beneteau dealer to recommend boating safety classes or further on-water instruction suited to your needs. Taking the helm of a sailboat or powerboat without prior experience is not safe or advisable. Finally, knowing how to handle varying sea conditions, weather changes and boat traffic is essential to ensure a safe day out on the water. Owning and caring for your first new boat can be a rewarding and pleasant experience, especially with Beneteau and our trained network of authorized Beneteau dealers by your side. Boating is a relaxing diversion from the hectic and demanding world in which we live. It is a sport in which the whole family can participate. We hope you join the Beneteau family soon!